Bushy Beard Grass For Sale online - Low Prices Online. Bushy Beard grass will look natural and beautiful when growing. Bushy Beard Grass - Andropogon Glomeratus. This type of grass is also known as Bushy Bluestem. It can reach as tall as six feet, and its leaves alone are around three feet. It has quite large, cream-colored inflorescences - a group of flowers on a stem that is generally composed of one main stem or a complex arrangement of branches. While the Bushy Beard Grass is now found in many parts of the world, it is native to both North and South America. The grass, more generally described as a bunchgrass, is mostly used for ornamental purposes. Bushy Beard Grass will love to be where the soils are moist but can also grow in various average soil conditions. The stems are slender and look close to the grass; often this plant is mistaken as a grass weed. The roots are a large clump of fibers or which looks like strings.This plant has places where the leaves join called nodes; this is where they attach themselves to the plant itself. Birds, ducks and other animals playing in this plant, eating this plant or the wind help with seed spreading and this plant regrowing. The leaves are small and don't even grow up to an inch wide. The foliage is green in the spring and summer and then in the fall will turn orange, yellow. This plant does not do well in drought or hot heat. This plant is tolerant to deer. Bushy Beard Grass will be very easy to grow. This is a good grass if you have a large area to cover a landscape or field. 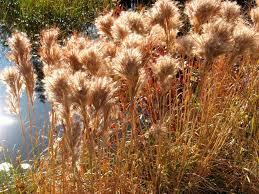 Bush Beard Grass does excellent in moist soils and also natural soils. Bushy Beard Grass is very maintenance free. Growing in many areas is effortless. The stems have several nodes where they are joined similar to a humans joints.